For the 2012 Stiftelsen album, see Ljungaverk (album). 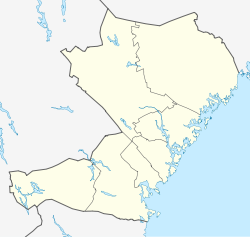 Ljungaverk is a locality situated in Ånge Municipality, Västernorrland County, Sweden with 885 inhabitants in 2010. In World War II the company Fosfatbolaget produced here in secrecy heavy water, which was delivered both to Nazi Germany and the Manhattan project. ^ Radio, Sveriges. "Tungt vatten till kärnvapen tillverkades i Ljungaverk - P4 Västernorrland". Retrieved 2018-01-22. This article about a location in Västernorrland County, Sweden is a stub. You can help Wikipedia by expanding it. This page was last edited on 22 January 2018, at 10:38 (UTC).